Use this forum to arrange and post reviews of other members' brews. Forum member Deebee sent me another great brew: SORTALVHEIM STOUT. First of all, I love its name, an allusion to one of the underworlds in Norse Mythology, home to the mysterious Black Elves. Tolkien apparently omitted them or merged them with the dwarves in his version of Middle Earth, but the actual Norse Eddas seem to list dark elves as a separate race. I have no problem imagining Deebee's stout as their elixir of choice. 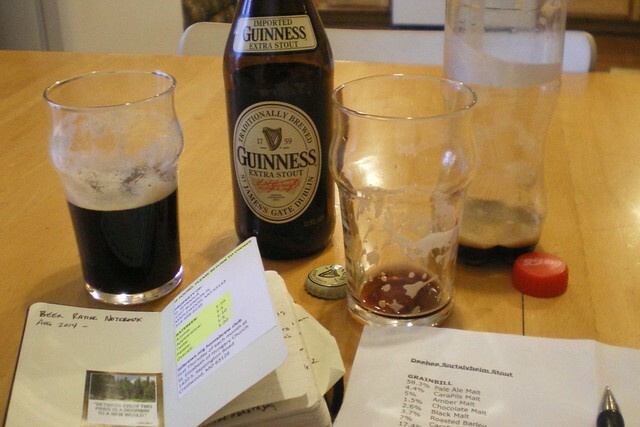 I stuck with the side-by-side review format, this time comparing and contrasting with Guinness Extra Stout. 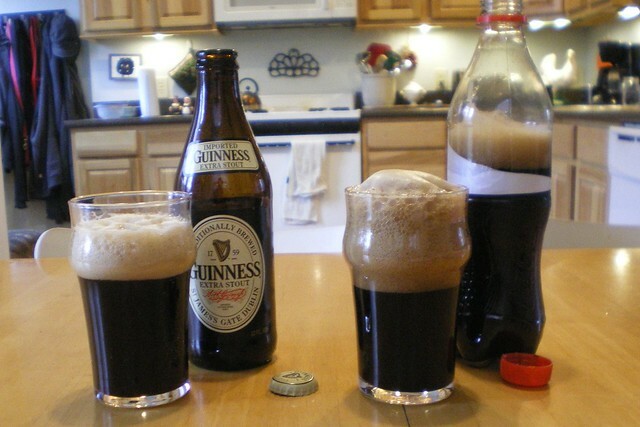 This commercial beer varies a bit worldwide, and is not the same as Guinness Draught, the one commonly served on tap, cans and bottles with nitro widgets. This Guinness Extra Stout is 5% abv with standard CO2 carbonation, a familiar true-to-style example of a roasty dry stout. I will be following the Ratebeer scoring system. As you can see, the appearance of Deebee's Sortalvheim Stout and Guinness Extra Stout look nearly identical. Sortalvheim was a shade darker. Opaque black with dense beige head of tight little bubbles. Attractive dark red tint at the corners when held to the light. Fantastic head retention and lace, excellent bottle-conditioning traits. Guinness is pasteurized, so Sortalvheim is an automatic winner in this category. Roasted grains, burnt toast, flowery and earthy English-style hops, rising bread dough, smoky campfire, wet leaf compost. More aromas and more complex aromas than Guinness by far. Sortalvheim had stronger vegetal/hoppy aromas than almost any dark ale, actually. Intensely toasty, roasty, pleasant burnt and charred flavours. Tart and slightly acidic, but not sour. Woodsy with lots of dark fruit esters and tannins, reminiscent of a bold red wine, unsweetened lingonberry juice, cough medicine (in a good way, if you can imagine that.) Cacao nibs, espresso coffee, grape skins, citrus rinds, nut shells, wood-fired pizza crust. Great English hop presence here too, an uncommon resiny taste which I enjoyed. Lingering multi-layered aftertaste which left a uniquely well-rounded bouquet of flavours. Dry, only a trace of residual sweetness. Nice job blending the roasted grain bitterness and hop bitterness, Deebee, this is a tricky balancing act. Lots going on, making Guinness seem bland in comparison. In terms of straight-up roastiness, Guinness had more, believe it or not. Medium-full body, bright acidity, faint chalky/mineral water mouthfeel, average carbonation. Sturdy strength but no unpleasant alcoholic heat. More assertive yeast character than Guinness. I happen to enjoy Whitbread-B's gritty, stone fruit tang, but those who don't would prefer Guinness' smoother fermentation profile. Well-crafted, complex, delicious. Tasty stout with distinct grainy and hoppy and yeasty notes, different from Guinness and different from your own Ragnarok Porter as well. Another very fine dark ale from a very fine brewer. Keep up the great work and thanks again for sharing! Deebee, have you submitted any of these exquisite stouts to homebrew contests? I think you'd do quite well. I loved it the way it was, I really did. But brewers often press me to suggest what I might have personally done differently. In case you're interested for next time: perhaps select a softer/more neutral ale yeast for broader appeal, unless of course you intentionally targeted this tart dark fruity edge (if so, well done.) Perhaps replace some of your flaked barley with oats for a creamier/silkier mouthfeel. If you like the hint of smoke in this beer, you could amplify it with some actual smoked malt too. And maybe, just maybe, add some liqourice root or candy to the boil. Perhaps include a small quantity of Simcoe hops with your late Fuggle addition to amplify the odd fruity/resiny aspect of this beer. No one would know what hit 'em, but they'd know they liked it. I bet this beer would taste even more divine cask-conditioned and dispensed via beer engine.